I’ve decided to create a level structure for my casual game ‘Lazy Larry’ because i wanted to design a level so this helps me chose which one to do and it just adds a bit of extra detail to the game. Just to explain why the levels are like this i will explain a bit of the story of ‘Lazy Larry’. So you play as Larry an average lazy guy and one day whilst watching TV you hear a noise in the attic so you go to investigate. You’ve been looking around the attic for a little bit and then you see a mysterious box, you’ve never seen it before and it has loads of strange markings on it. After looking at it for a little bit you decide to open it and all manner of hell starts spilling out, you try to close it but before you can a box hits you on the head and you get knocked unconscious, you wake up in your front garden. So Larry’s goal is to get to the attic and close the mysterious box that has merged his house with an evil dimension, that’s why he has to go through all these rooms to get to the attic. This is just a quick sketch i did to show the rout the player take. 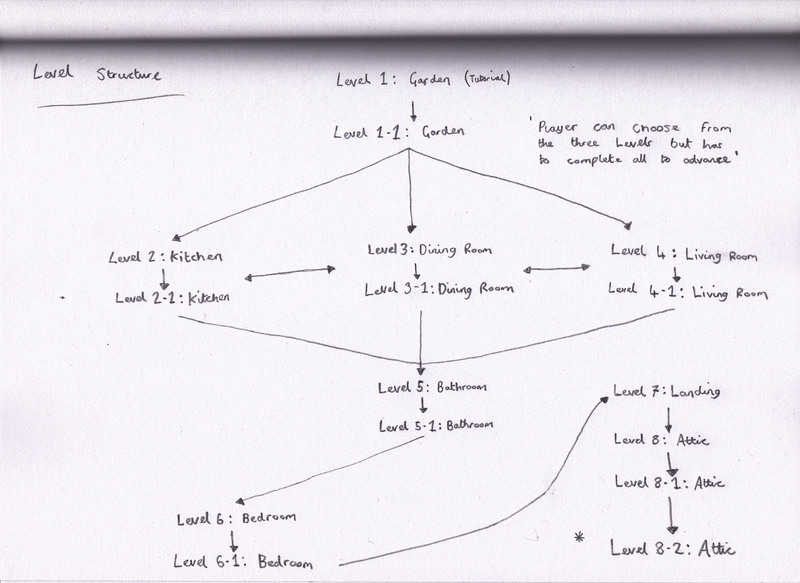 As you can see after the initial garden levels the player can choose between three levels to go next. They do have to complete all three levels to progress though they just get to choose the order.